After suffering heavy losses in the last quarter of 2018, global equities are posting surprisingly robust returns since the start of 2019. The MSCI ACWI is up 12% so far in 2019, and other risk assets such as Chinese A-shares (+21%), oil (+28%) and copper (+8%) are also rallying. Part of the early 2019 equity recovery can be explained by the severity of the Q4/18 sell-off. The S&P 500’s slide of –9% in December 2018 represents the worst December performance since 1931; a rebound from last Christmas Eve’s extreme oversold levels was expected. Still, the extent of the Q1/19 V-shaped equity recovery, and its pervasiveness, in our view appears questionable in the context of further deterioration in the macroeconomic landscape. Global leading indicators and business climate surveys have declined further since the start of 2019, and a trough remains elusive. The world manufacturing Purchasing Managers’ Index (PMI) is currently hovering near the 50 level, down from 54 a year ago. Weakness has been especially visible in Europe, Japan and China where these surveys are hovering near 48. The U.S. manufacturing survey (ISM) has bucked the global downtrend, but recent momentum is hinting at muted growth in U.S. manufacturing and industrial production following a banner year in 2018. Should the Institute for Supply Management Index (the ISM, now at 54) mean-revert lower toward the 48-50 zone, the impact would surely be felt globally, thus postponing the market’s hopes of a quick second half global economic rebound. 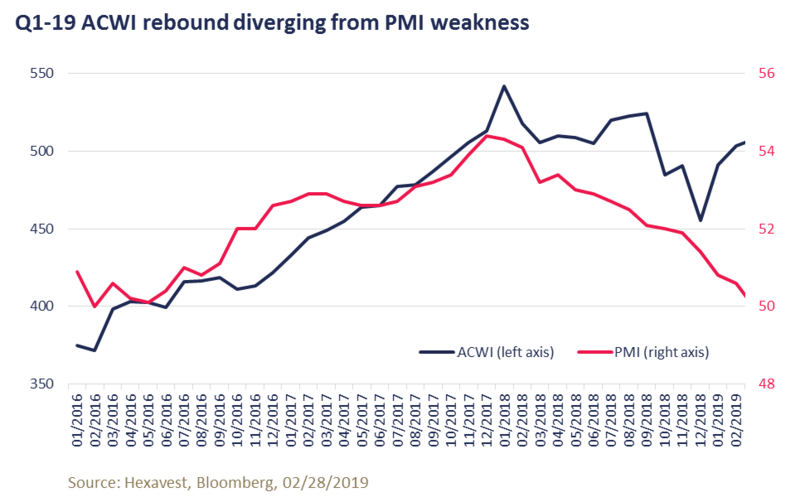 Equities succumbed to the world PMI downtrend in the latter part of 2018, but the recent divergence is somewhat perplexing, as bottoming signs are not yet in sight. Recent reports from the likes of shipping companies such as FedEx continue to hint at deterioration in the early days of 2019. Another divergence worth pointing out has been equities (up) and earnings revisions (down). Although the pace of negative revisions has slowed following steep cuts, equity performance has significantly diverged from the bleaker earnings outlook. The reversal in U.S. monetary policy expectations has marked a key shift in Q1-19, representing a major reversal in interest rate expectations and taking away a major headwind that caused havoc last year. Treasury yields have declined 15-20 basis points so far in 2019, as investors have swapped their rate hike scenarios for a scenario of a prolonged pause and an imminent end to quantitative tightening. Consequently, valuations have been the main beneficiary and multiples have expanded. According to Scotiabank, P/E expansion has contributed to 108% of the S&P 500’s 12% year-to-date gain. Other central banks have announced a pause in their normalization process, and the global easing bias is masking fundamental weakness for now. Recent double-digit equity returns appear to be discounting a notable improvement in global macroeconomic conditions for the second-half of 2019 that would power earnings growth. Record levels of stock buybacks are also contributing to the market’s ascent. We remain doubtful that global growth will quickly improve in light of more moderate U.S. momentum and still-weak Asian export data. MSCI EPS growth is poised to stall in 2019 and we stand by our view that an earnings recession scenario is underpriced in the market. Similarities between today and the 2016 market bottom are also shaky. Equities, PMIs, and earnings revisions bottomed in the spring of 2016, with fiscal (U.S. tax reform) and monetary stimulus combined to pro-growth policies in China setting the stage for the 2017 synchronized global economic rebound. While risk assets have assumed leadership in 2019, declining yields and flatter slopes point to another conundrum. If global growth does recover faster than we anticipate, the outlook for monetary policy would surely evolve and yields could revisit last year’s highs. Hence, P/E multiple gains would be in jeopardy. An imminent trough in global economic activity cannot be ruled out, and we would adapt accordingly should GDP and EPS revisions recover sooner than we expect. Our game plan for 2019 was/is to look for bottoming macro signs in order to gradually increase our cyclical exposure. We have modestly increased cyclical content in emerging markets, Europe and Asia since late 2018, but our exposure and positioning in U.S. equities remains cautious. Source of all returns: Hexavest as at March 26, 2019, unless otherwise specified. The MSCI ACWI returns presented are those of the MSCI net Index in local currencies provided by MSCI. U.S. equity markets returns presented are those of the S&P 500 Index in U.S. dollar provided by S&P. Chinese A-Shares, oil and copper returns were provided by Bloomberg. The information included in this document is presented for illustrative and discussion purposes only. It is meant to provide an example of Hexavest’s investment management capabilities and should not be construed as investment advice or as a recommendation to purchase or sell securities or to adopt any investment strategy. Any investment views and market opinions expressed are subject to change at any time without notice. This document should not be construed or used as a solicitation or offering of units of any fund or other security in any jurisdiction.